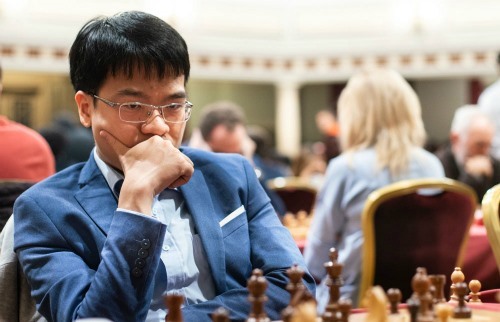 HÀ NỘI — Việt Nam’s No 1 chess player Lê Quang Liêm beat Brazilian grandmaster Krikor Mekhitarian in the third round at the Isle of Man (IoM) International Chess Tournament, held yesterday at Villa Marina, Isle of Man, England. Liêm, Elo 2,715, overcame Mekhitarian, Elo 2,546, after 25 moves, getting 2.5 points and standing in Group 2 of the tournament. After drawing to Indian Kalyan Arjun, Elo 2,408, in the first round, Liêm got back on track with 2 consecutive wins. His next challenge will be yet another Indian player, 27-year-old Abhijeet Gupta, Elo 2,588. Liêm is the only player from Việt Nam to compete in the tournament, which has attracted 6 grandmasters from the world top 10. He is considered 14th seed, invited by the Chess Professional Association (CPA). There are also 20 super grandmasters (Elo higher than 2,700) participating in the tournament. ‘Kings of chess’ Magnus Carlsen and Fabiano Caruana are absent as they are taking part in other world chess tournaments. The tournament is also attended by many other top players like Levon Aronian, Maxime Vachier-Lagrave, Vladimir Kramnik, Wesley So and Viswanathan Anand.